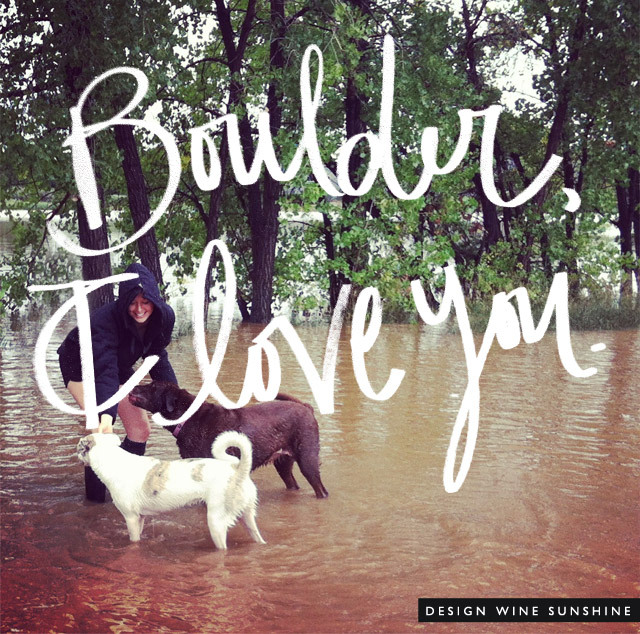 Boulder… flooding? Please forgive me – I’m still a little stunned. I just wanted to send a little note with a bit of reflection on my community. For those of you that find this tiny blog around the country, or even the world – Boulder, Colorado is one of the most beautiful cities I’ve ever seen, full of not only fabulous food, and happy, healthy people, it’s home to amazing open spaces, trails, and creeks – thousands of miles of outdoor adventure. Sure, the Boulder Creek that runs through the heart of the city has furiously risen a few times since I’ve moved from Georgia lands five years ago, but I’ve never, ever seen anything like this. To put it into perspective – Boulder happily hugs to the fame of boasting 300+ days of sunshine. When it rains, it’s usually a 15-30 minute sprint, then it dies down and the sun comes back again. Sure, Colorado weather changes every 10 minutes – but damn, mother nature! —- BILLIONS of GALLONS of RAIN??? In the aftermath of days on top of days of flooding, we’ve lost lives, communities, farms, countless road systems, and almost all of our open space trails. I never imagined that we could be recovering for not only months, but years to come. Thankfully, our little family is safe, although I can’t speak for all of my friends, who have been dealing with areas of flood disaster I can’t even begin to comprehend. I’m not very good at wording these types of things, but for anyone out there who’s been affected by all of this, I just want to encourage you to stay strong, stay present. If I could be there with all of you, I’d bring my biggest hugs and love, and equipped with goulashes prepared to muck through and help you rebuild. And on that note, just wanted to send a HUGE thank you to everyone who’s helping out there. We’re so incredibly lucky to live in a community of hard working people who are coming together to keep Boulder moving forward. Cheers, Boulder! I love you.